Federal Health Care Fraud Statute 18 U.S.C. 1347 - Oberheiden, P.C. In order to understand the implications of 18 U.S.C. Section 1347 for medical practitioners and health care providers, it is necessary to examine the statute’s key provisions in detail. First, in order to be guilty of health care fraud under 18 U.S.C. Section 1347, it is necessary to “knowingly and willfully execute” a fraudulent scheme. While presenting proof of actual knowledge is one way that prosecutors can obtain a conviction, in some cases, constructive knowledge can be sufficient to establish criminal culpability for health care fraud as well. Under the federal constructive knowledge standard, if a person is aware of a high potential for illegal conduct and takes steps to purposely avoid learning about the illegal conduct, this can be enough to establish knowledge in some cases. Under 18 U.S.C. Section 1347, an attempt to commit health care fraud is punishable to the same extent as the successful commission of fraud. An “attempt” requires intent to commit fraud as well as a “substantial step” toward commission of the crime. When investigations do not produce sufficient evidence to charge health care providers with fraud, federal prosecutors will still often pursue attempted fraud charges under 18 U.S.C. Section 1347 as well as attempt and conspiracy charges under other federal statutes (such as 18 U.S.C. Section 1349). As a criminal statute, 18 U.S.C. Section 1347 imposes severe penalties for health care fraud. 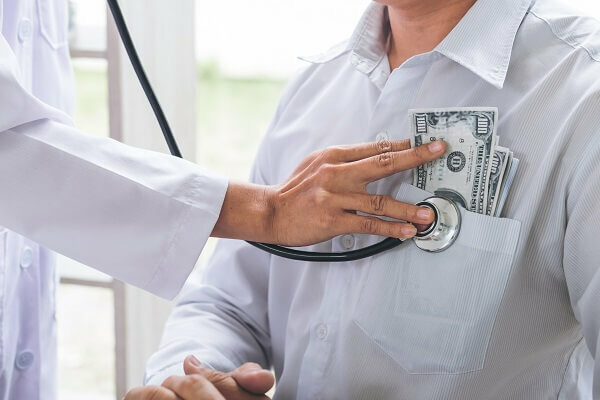 In a “standard” case, a health care provider charged under the statute can face fines of up to $250,000 (for individuals) or $500,000 (for organizations), and up to 10 years of federal imprisonment. If the fraud results in serious bodily injury (i.e., a patient overdoses on a prescribed opioid medication that was not medically necessary), the term of imprisonment can increase to 20 years. And if the fraud results in death (i.e., a fatal overdose), a single charge under 18 U.S.C. Section 1347 can carry a life sentence. In order to be guilty of health care fraud under 18 U.S.C. Section 1347, you do not need to know that your conduct is unlawful, and you do not have to specifically intend to illegally defraud a health care benefit program. If you are aware, or if you are willfully ignorant of the fact that you are involved in a fraudulent scheme, this is enough to satisfy the mental state (or “mens rea“) requirement of the law. When facing an investigation under 18 U.S.C. Section 1347, it is common for health care providers to face allegations under a variety of other civil and criminal federal statutes as well. This includes the False Claims Act and Stark Law that we mentioned above, as well as the Anti-Kickback Statute and a variety of other fraud, controlled substance, and health care-related laws. Federal prosecutors are aggressively pursuing cases against health care providers nationwide, and avoiding charges, conviction, and sentencing requires a strategic and comprehensive approach to defending your business or practice. We are a team of experienced health care fraud defense attorneys and former U.S. Department of Justice (DOJ) prosecutors who represent health care providers nationwide in civil and criminal matters. If you are concerned about potential legal exposure or are currently being targeted in a federal investigation, we encourage you to contact us promptly at (888) 519-4897 for a free and confidential case assessment. This information has been prepared for informational purposes only and does not constitute legal advice. This information may constitute attorney advertising in some jurisdictions. Merely reading this information does not create an attorney-client relationship. Prior results do not guarantee a similar outcome for any matter in the future, every case is different. Oberheiden, P.C. is a Texas LLP with its headquarters in Dallas. Mr. Oberheiden limits his practice to federal law.